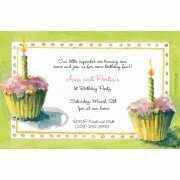 This 5.75" x 8.75" invitation is perfect for either a boy or girl birthday party. White enve.. 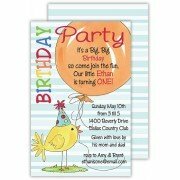 This 5.75" x 8.75" birthday invitation is perfect for either a boy or girl. White envelopes .. 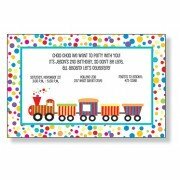 This 5.75" x 8.75" invitation of a train is perfect for birthdays or train themed parties. .. 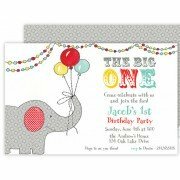 Celebrate your one-year-old's first birthday with this multi-piece card that reads "Look who's tu.. This adorable die cut features a flocked blue lamb. Your text is printed on a separate card and i.. This adorable die cute features a flocked pink lamb. Your text is printed on a separate card..